Dear readers, I will be traveling all day, so I beg your indulgence in putting up with the repeat of a post which first appeared here last November. Regular service will resume with Friday's column. The San Giovanni Baptistery stands in the heart of Florence, directly in front of the city's most famous structure, Santa Maria del Fiore Cathedral, also known as The Duomo. The church and its dome are so large that they dwarf the baptistery by comparison. Nevertheless, a simple look inside its cavernous, octagonal space easily shatters this illusion. In Antonio Neri's time, this place was a civic hub; a space where masons and tailors rubbed shoulders with nobles and princes. One of the oldest structures in the region, it was also one of most cherished, clad in polychrome marble, with imposing bronze doors intricately sculpted by masters. Michelangelo dubbed them "the gates of heaven." It was here, in this ancient basilica that the future of Tuscany could be seen plainly, in the eyes of its youth. New generations of Florentines were welcomed into the world by their neighbors, anointed and christened, as they had been for centuries. The current structure dates to the eleventh century, but it replaces octagonal baptisteries built on the same spot as early as the fourth century, originally surrounded by a cemetery. 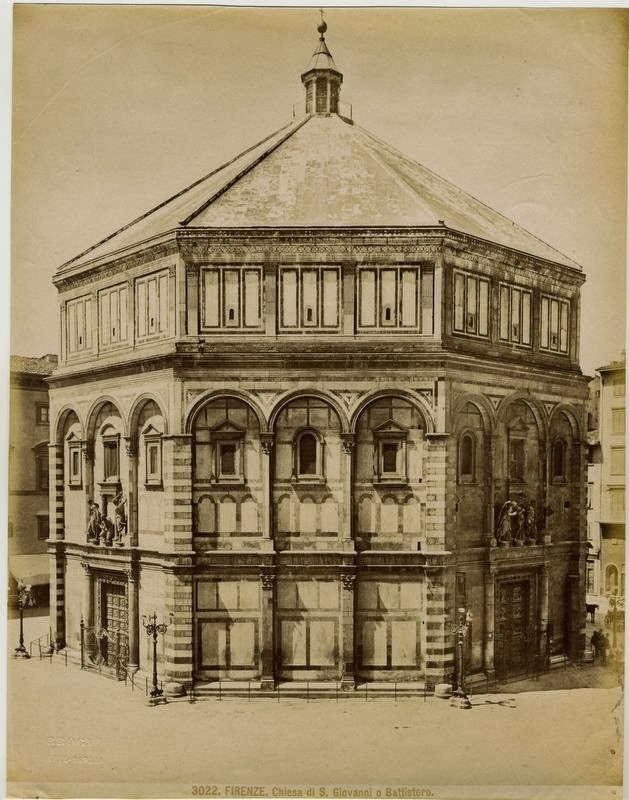 Antonio Neri was baptized here, as were all his brothers and sisters, his parents, some grandparents and quite possibly some much earlier relatives. His sponsor, Prince Don Antonio and his Medici ancestors were also given rights at San Giovanni, in the same octagonal marble bath at its center. The unusual font was a sister to the one still standing in the identically named baptistery in Pisa. Along each side, there was a dry-well. By standing in it, a priest could perform the ceremony and avoid jostling by the crowd. Legend tells that one of the stations showed the repair made after poet Dante Alighieri took an axe to a well in order to free a child who had become entangled and was at risk to drown. The font was replaced later in the same year of Antonio Neri’s birth, 1576, on orders of the Grand Duke, in preparation for a royal baptism. The ancient mosaic tile floor, although repaired many times, still shows its original signs of the zodiac and other early Christian iconography. As a newborn infant, tightly wrapped in swaddling, Antonio Neri would have been carried across that floor, busy with families and children, and then gently handed to the priest, perhaps by his father, already a famous physician. Joining them would be his grandfather the barber surgeon, his other grandfather the lawyer to Michelangelo, his godparents, other family, friends and perhaps a wet nurse. His mother stayed at home with her close friends to recuperate from the ordeal of birth, and to prepare for a neighborhood celebration. Even in the dead of winter, if his eyes were open, the sparkling glass mosaics covering the entire domed ceiling of San Giovanni could not have failed to catch the wandering eyes of this future glassmaker.